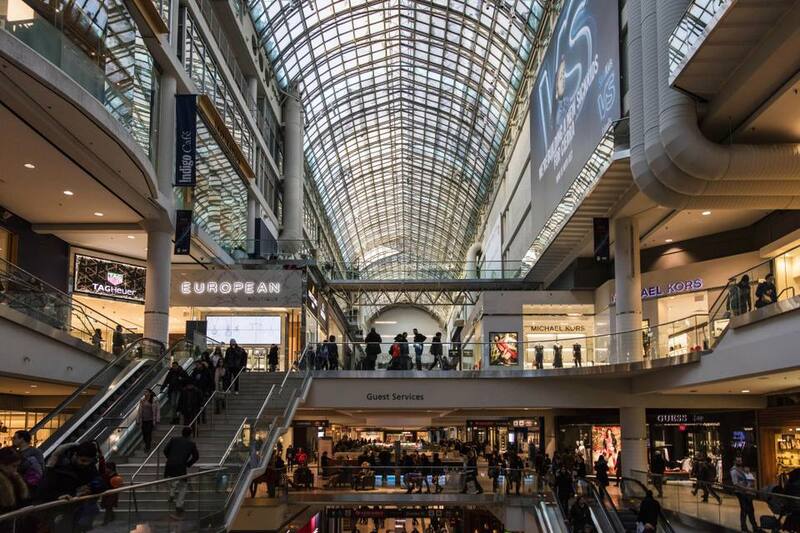 Covering two downtown city blocks and boasting more than 230 stores in a bright and airy retail space, the Toronto Eaton Centre welcomes millions of Canadians and international travelers every year, rivaling the CN Tower as the city's top tourist draw. The shopping centre has undergone extensive upgrades since 2010, including the addition of an impressive modern food court and brand-name stores like Victoria's Secret and Michael by Michael Kors. In 2016, Nordstrom and Uniqlo joined the retail lineup. At the time of its opening in 1977, the Eaton Centre set the standard for retail architecture and retailing. The mall, which was modeled after a galleria in Milan, Italy, featured vaulted glass ceilings and open, multi-levels of pedestrian and retail space. Well-known Canadian artist Michael Snow provided the whimsical flock of geese sculpture that hangs from the ceiling. Though still called the Toronto Eaton Centre, the mall has not featured an Eaton's store since 1999, when the retail chain went out of business. Founded by Timothy Eaton in 1869, the Eaton's store had a longstanding and important role in Canada's history. Initially a small dry-goods store, Eaton's grew to be the largest retailer in Canada famous for its elegant yet practical stores, no-hassle returns policy, annual Santa Claus parade and home catalog, which could be found in almost every home in the country. The loss of the Eaton's department store, including the flagship store on Yonge Street in Toronto, truly saddened Canadians who hold dear their memories of shopping there and hours spent perusing the catalog. Maintaining the Eaton's name on Toronto's largest shopping center is a tribute to Timothy Eaton and the institution he established. The Toronto Eaton Centre is at 200 Yonge Street, between Dundas and Queen streets and Yonge and Bay. The Eaton Centre is accessible by the Dundas or Queen subway stops. The King Street or Queen Street streetcars have stops at the Eaton Centre. The Eaton Centre is about a 15-minute walk from Toronto's Union Station. The Eaton Centre is on the underground PATH system that connects many downtown attractions. Avoid expensive parking fees and driving hassles and take public transit. If coming in from out of town, drive to a GO Station, park there for free, and take the GO Train into Union Station. Ask your hotel about free shuttles to and from the Eaton Centre. Go hungry. There is a wide array of excellent places to eat. Even the food court will satisfy international or vegan and vegetarian food tastes. Grab that free wi-fi. It's available everywhere in the mall. A nursing center for moms and their children is available in the Urban Eatery. The Grand Hotel offers good accommodation at reasonable rates. The Grand Hotel has free shuttles to and from the Eaton Centre or is a 15-minute walk. The Chelsea Hotel caters to a range of travelers, from families to business executives. Several budget hotels are close to the Eaton Centre. Luxury hotels are also in the vicinity. The Marriott Hotel is connected to the Eaton Centre.